I have delivered the quilts to my sister-in-law, I really wanted her to see them in person before I posted these pictures. 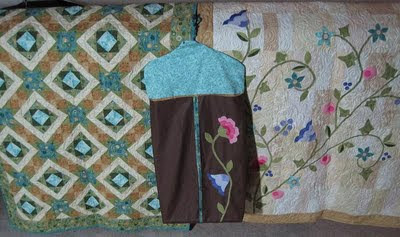 The first picture has both of the quilts and the appliqued diaper hanger. The baby boy quilt is really soft in person but does not look that way in pictures. She wanted two very different quilts for the twins. She is using chocolate brown sheets and has creamy yellow walls in the nursery. Her rocker is sage green. And the colors for the quilt were taken out of the really cute artwork that they purchased for the nursery. The Baby Boy quilt is really very traditional. In person you can change your focus and get different shapes the picture really highlights the cream diamond shapes. My sister-in-law saw a much bigger version of this quilt in Super Simple Strips by Nancy Smith and Lynda Mulligan. She really surprised me by noticing the quilting. She keep looking at the quilt and then finally asked if I could quilt like that. I realized at that point that she had never seen anything that I have longarmed. 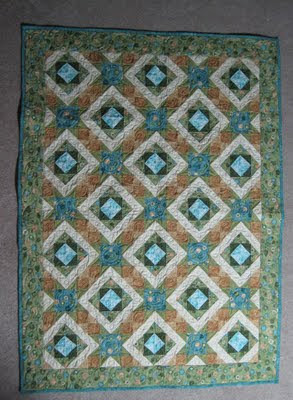 My quilting is a little different then the books, of course, but does give the quilt the same windy movement. 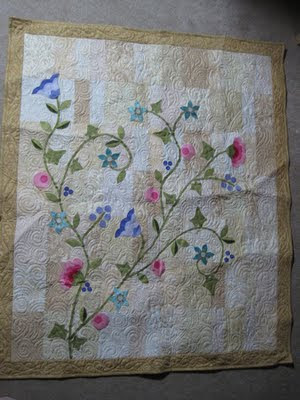 The challenge for me was the applique the quilting was the fun part of the quilt. Now every needs to keep their fingers crossed that one of those twins really is a girl. We are hoping that we won't find out for sure until mid-September.